The Third International Festival of saxophone xalapa 2018 awaits them from 3 TO 7 September. NAMM show is just around the corner; and this year P. Mauriat will be launching 2 new products: PMT-75 trumpet series, featuring interchangeable bell and leadpipe, and Master-97 Tenor model. Find us at Booth# 9133." Music China is around the corner and P. Mauriat will once again attend the show with some exciting surprises for the fans and visitors. 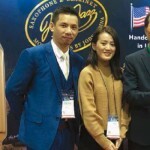 This year the brand will be represented by top musicians such as Darren Rahn, Arno Haas, Reiner Witzel, Koh mr. saxman, Greg Zhang and the most recent addition to the artist family “Saxpackgirls” from Thailand. Lightning-Fast and Crystal-Clean" is a unique video series inspired by the awe I experienced as a kid, listening for the first time to Michael Brecker tearing effortlessly up and down the horn. This program is intended to serve as the only course on technique that a sax player would ever have to invest in. The material here is based on years of experience identifying the exercises and concepts that were most transformational to my students as well as myself in the realm of technique, while at the same time expanding improvisational vocabulary. Welcome Ricardo Branco, the first official endorsing artist from Portugal. Branco is one of the most outstanding sax artists of his generation in Portugal. He is able to play any genre of music from Smooth Jazz, Pop, Latin Jazz, to Funk.